Buddy, Can You Spare A Rib? 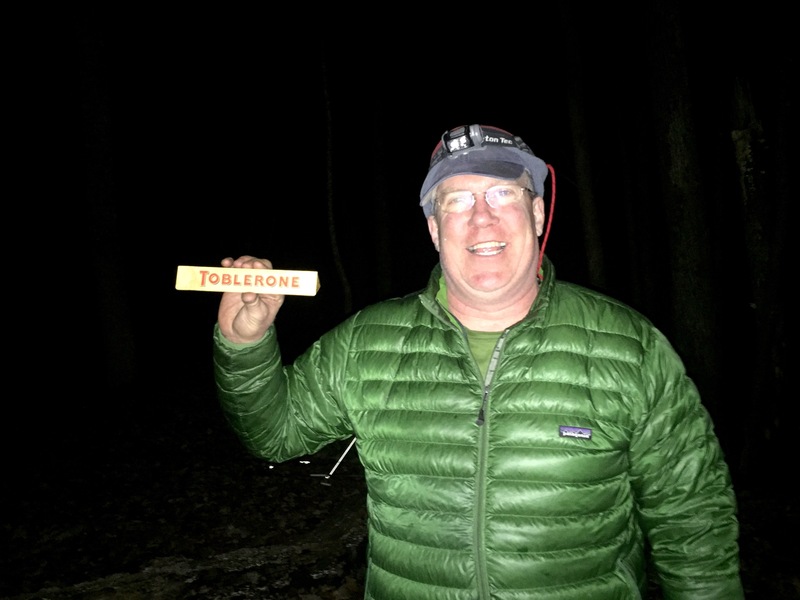 Virginia is bracing for record-breaking snowstorms tomorrow, but I’m still basking in the glow of a fun backpacking trip last weekend with my friend KB. We went to Brown’s Hollow, near New Market, Virginia, and we had a fabulous hike. 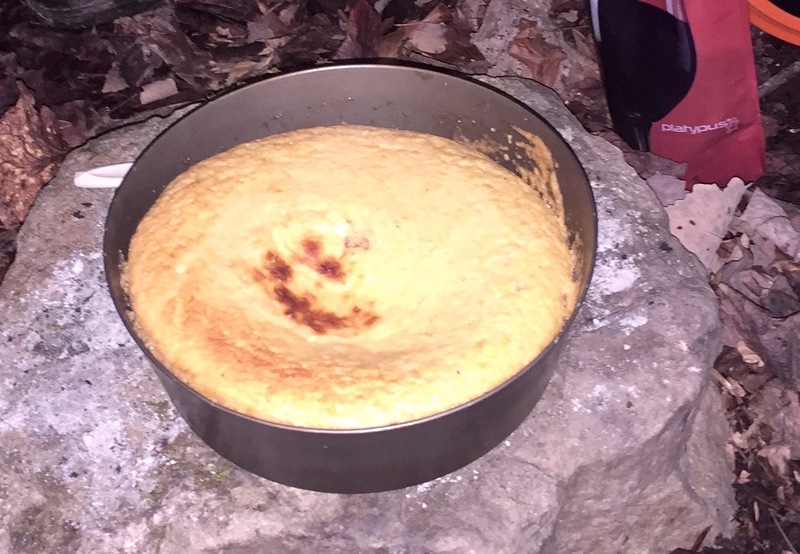 We also cooked up a storm, and once again our frybake dutch oven came in very handy. Past frybake meals have included lasagna, cheesecake, enchiladas, even Baked Alaska, but we’ve never deep-fried anything–until this weekend. 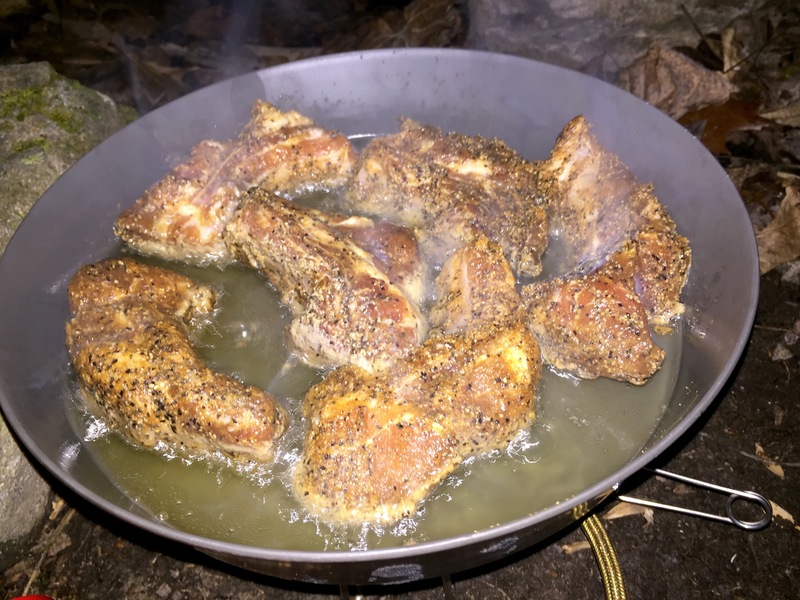 Barbecued ribs have always been a favorite dish, but a dish that typically takes hours–which is completely impractical in the backcountry. But deep-frying offered a shortcut, so we decided to give it a try. To make it happen, we brought along a rack of pork ribs (of course), two cups of peanut oil, and some extra stove fuel. We used a recipe for beef ribs that we adapted a bit, and in true Eiger Sanction tradition I was smart enough to get KB to carry the ribs. Brown’s Hollow is a great hike along a beautiful stream, complete with cascades and beautiful views as well as some interesting rock formations. And, like much of the Blue Ridge Mountains in Virginia, it offers both geological as well as human history. The hollow was named after the family of former Old Rag postmaster William Brown, whose ancestors lived in the valley through the 1800s. Life could be a challenge in those days, but much of the recorded history is decidedly upbeat. One of William Brown’s descendants shared that his family “may have been poor people, but compare them to the people in the soup lines in the Depression. They grew everything they needed, except coffee and sugar.” Food for thought. After a really nice hike on a well marked trail, we dropped our packs, set up camp, and headed up to the saddle of Brown’s Mountain. 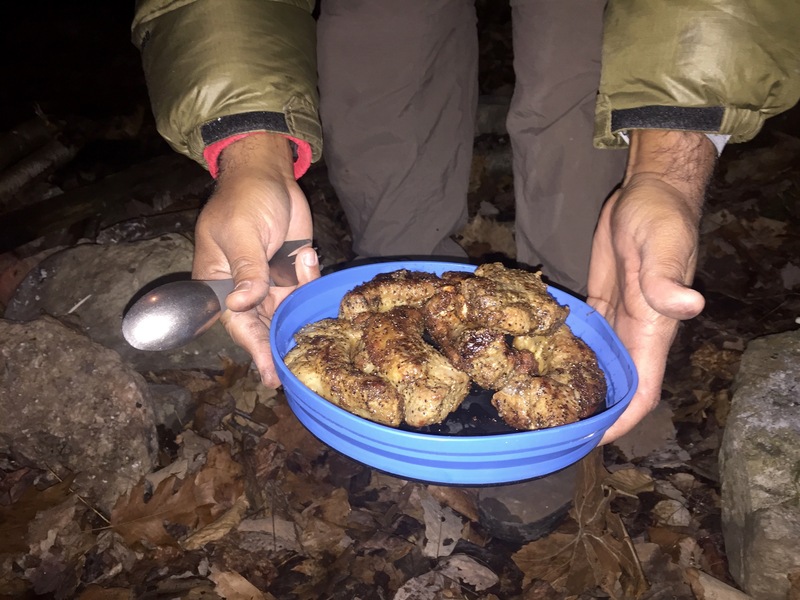 Once back at camp, dinner started in earnest with bacon-wrapped stuffed dates (hey, why not?) and then we baked some cornbread (also in a frybake, of course). 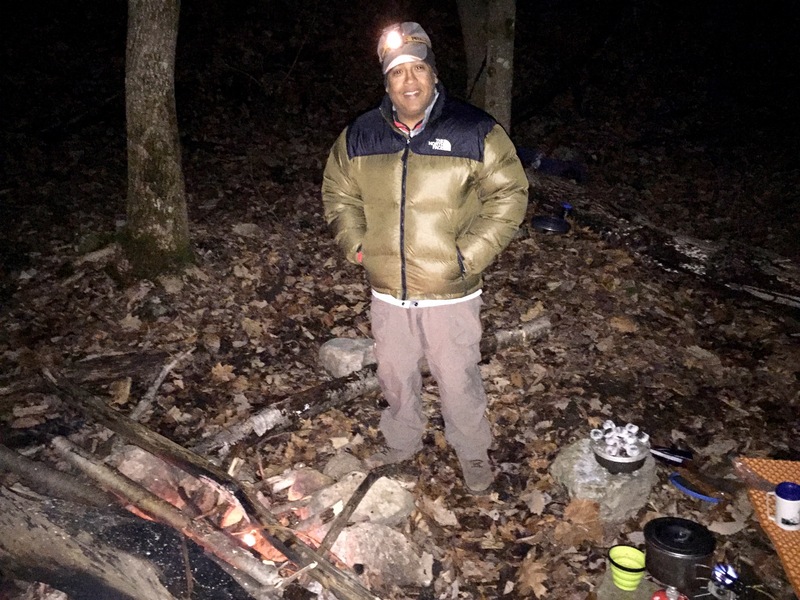 While the cornbread was baking, we heated the peanut oil to 350 Fahrenheit (our MSR Dragonfly stove was a key, as was a small instant-read thermometer) and got busy with the ribs. 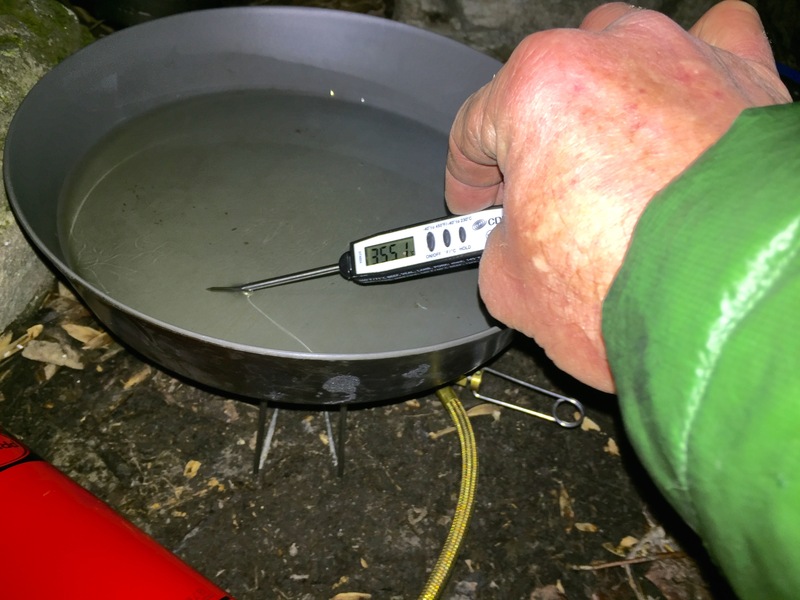 It was tricky to maintain the temperature of the oil on such a cold night, but in the end it worked out just fine. 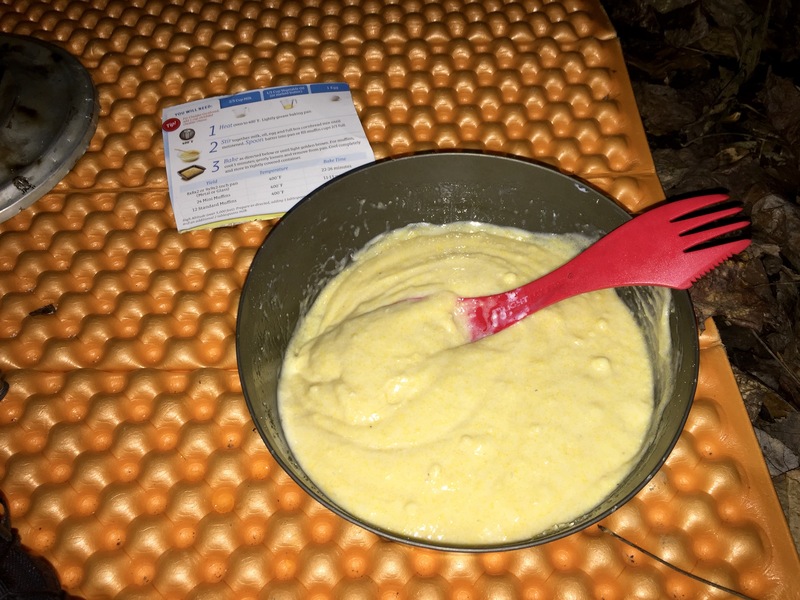 In addition to the cornbread, we cooked up some beans, and we topped things off with some Crown Royal and Swiss chocolate. 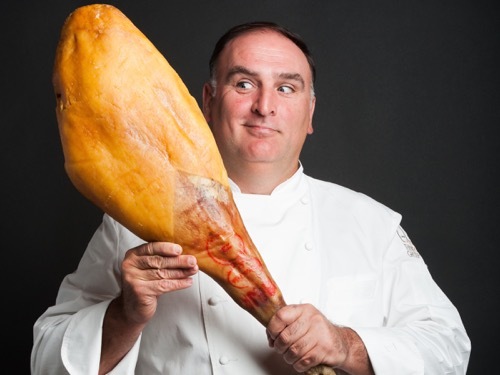 Celebrity chefs like José Andrés couldn’t have done it better (ok, so actually José could’ve done better. Much better. But let’s see him hike.). Brown’s Hollow was a new destination and fried ribs was a new recipe, but both proved to be good choices. 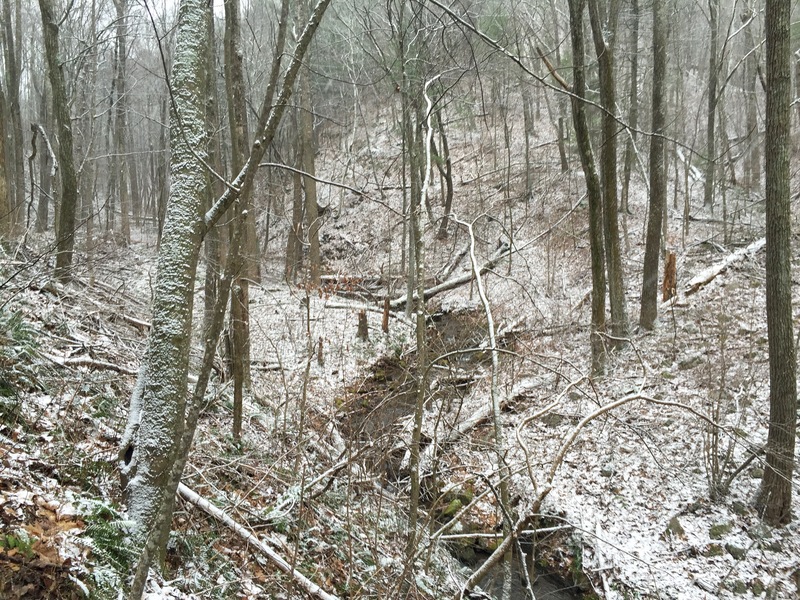 We also enjoyed the chilly weather, with lows in the 20s and a dusting of snow. The cold seemed like an invitation to shamelessly consume a lot of calories, a task that we took very seriously. Adventures with KB, a great friend for nearly 30 years, are always fun. We had a nice hike, we stayed warm enough, we shared a lot of laughs, and we ate well. Sure, our pants are fitting a little tighter, but isn’t that the point? (ok, don’t answer that).